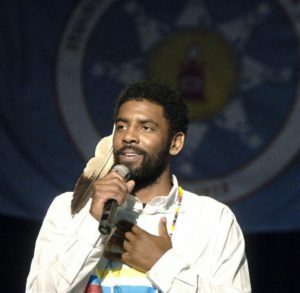 “Kyrie Irving is a professional basketball player for the Boston Celtics of the National Basketball Association (NBA)…As part of the Team USA basketball squad, he earned an Olympic Gold Medal 2016 Summer Olympics in Rio de Janeiro…The family connection to Irving comes from the White Mountain family (also known as Mountain) of the Standing Rock Sioux Tribe. 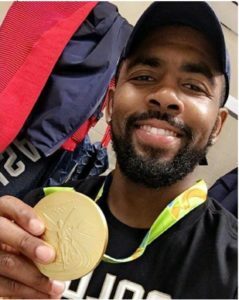 Irving won a Olympic Gold Medal at 2016 summer games. The White Mountain family comes from the Bear Soldier District, on the South Dakota side of the reservation. His late mother, Elizabeth Ann Larson, was adopted out of the Tribe when she was a child. Irving’s grandmother is the late, Meredith Marie Mountain, who is a citizen of the Standing Rock Sioux Tribe. His great-grandfather is Moses Mountain and great-grandmother is Edith Morisette-Mountain. During the Standing Rock resistance to the Dakota Access pipeline, Irving gave his support to the Water Protectors. Irving designed shoe for Nike N7 line to honor water, his tribe and his mother. 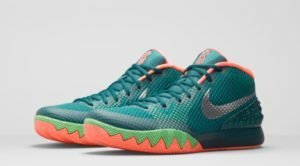 Irving recently released a Nike N7 shoe, that he designed, to honor the water, the Standing Rock Sioux Tribe, and his late mother. Additionally, he has a tattoo of the Standing Rock Sioux Tribal logo on the back of his neck. Irving is very proud to be Lakota and to be from the Standing Rock Sioux Tribe. Get an email alert for new lesson plans and posts. We do not traffic in advertising, so you’ll never receive anything from us but these alerts. We use MailChimp to collect email addresses and manage our alert mailing lists.